The last few posts have been all about how to be conscious about ends--how to work them in as you go, so as to eliminate the trouble they cause if left unattended. Ironically, I failed to take my own advice on a new project. I usually fish around inside of a new skein to find the inside end, so the yarn feeds from inside the ball. With an inside feed, your skein is less likely to be a kitty magnet--every pull won't make your skein jerk and jump around the way an outside feed will. The careful thing to do when you're using an inside feed is to wrap the outside end firmly around the outside of the skein, several times. 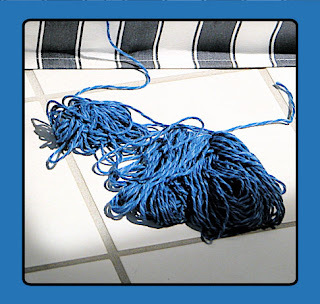 As you knit, the skein gets smaller; what was once firmly wrapped is now loosely wrapped, so this little wrapping chore has to be done a few times during a project. If you forget to re-wrap, well...a loose end is the devil's plaything. The loose outside end will invariably find and tangle with the inside feed. Fail to keep track of that outside end--as I have done today--and you will have your own sad tale of tails. This is a new yarn from Brown Sheep called serendipity tweed. On the (minor) downside, the high cotton content of the yarn means tangles are a problem--more like knots in a ball of string than tangles in a woolen skein. On the (major) upside, the cottony content means it doesn't make your hands sweat for summer knitting!